My internet search to get some background on this North Coast Petite Sirah was quite unsuccessful, to the point I couldn’t find one drip of information. The only tidbit I did learn was that “armen” is the Swedish word for arm. 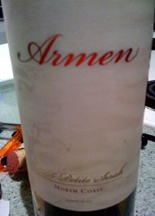 So I’ll jump right into my tasting notes for the 2005 Armen Petite Sirah that we picked up from a wine tasting at The Wine Cellar here in Midlothian. A note on the 2005 North Coast vintage – it was preceded by a late warm winter, a cool wet spring and a generally even mild summer. All in all a typical fruit forward Petite Sirah and for $16 – $18 not a bad deal. New world all the way, the jammy fruit forward style that was Zinfandel in nature was a pleasurable drink but fairly one (1 ½) dimensional, although the length of the finish was quite surprising. I will say the one to one and a half dimensions of fruit were all very real, nothing fake tasting or over extracted, very well done for this style of wine. Not sure, but I think Roanoke Valley is the only distributor bringing this in, at least to Virginia, so I am not sure of the distribution. If you want a good dark fruit, jammy wine, that isn’t too over the top, give this one a whirl. Not sure if I can use “whirl”, has Gary Vee trademarked that yet!! This installment of Wine Blogging Wednesday is sponsored by Sonadora at Wannabe Wino, and she has picked the topic of Petite Sirah. It just so happened that a few days after the Petite Sirah WBW #40 was announced, there was one on the tasting sheet at the Wine Cellar. 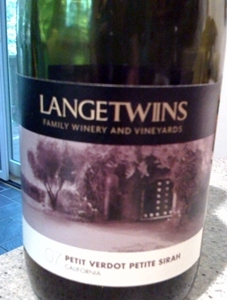 After enjoying it quite a bit that night, we brought a home a bottle of the 2005 Peltier Station Petite Sirah ($16.95) to drink and write about for WBW. 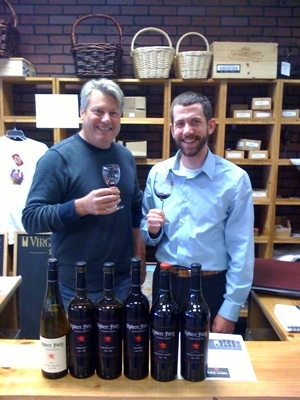 The wine is from a single vineyard grown in Elk Grove which is at the Northern tip of the Lodi AVA. The vineyard is comprised of clay soil and receives a consistent breeze from the Sacramento River Delta that allows the grapes to achieve longer than normal hang times. After reaching a brix of 25.8 the grapes were whole cluster fermented for 2 weeks before heading into French oak barrels for aging. Interestingly the name of the winery comes from its location on a 1900’s railroad spur that was used to carry fruit from packing sheds along or near Peltier Road. With its rich dark color the Peltier Station Petite Sirah lets you know it means business right off the bat. Even though it was a fairly fruit forward wine, the aromas and flavors continuted to develop over the hour that we drank it showing its complex nature. This is only the 3rd Petite Sirah I have had, other than ones I have tasted at wineries and wine shops and I have to say I am really enjoying the varietal.